The final member of Fanstoys trio of bug-bots, Forager rounds out the team with a fairly simple and effective package. He’s got the looks! He’s got the style! But does he have what it takes to stand shoulder to shoulder with 2 of the strongest Fanstoys releases that I’ve gotten my hands on so far? Thanks to Blast Off Toys and Urban Pop Shoppe, We’ll get a chance to find out! Let’s “Kickback” and take a look at Forager in detail. Forager’s robot grasshopper alt mode is all legs. It’s a compact and clean alt mode with very little extraneous detail. The rear legs are a simple affair made up of the robot mode legs with the shin panel slid up and the spindly bug legs unfolded. He’s able to hold a few basic poses in this mode but much like Grenadier, there really isn’t much for him to do as a bug. He can eat some Energon, wiggle his antenna, and grab on to smaller bots with his front legs. The chromed wings have a hinge at the base that allow you to fan them out if you like, to show Forager flying or relaxing with his wings down. I didn’t play too much with this joint as I have heard that it can be fragile and I didn’t want to risk any damage to this sample as it doesn’t belong to my collection. His front legs can rotate, and if you want to have him pouncing on another bot they can work almost like claws to wrap around the arms or shoulders of an unsuspecting Autobot. Forager’s antenna are made of a soft rubber that makes them a lot more resilient to wear and tear or bending, but also makes it tricky to reposition them. You want to try and get a good grip on the base of the antenna and swivel them, rather than pulling on the antenna as they are quite thin in some spots. Depending on your preference you may not even move the antenna but I like them to stick up in bug mode. 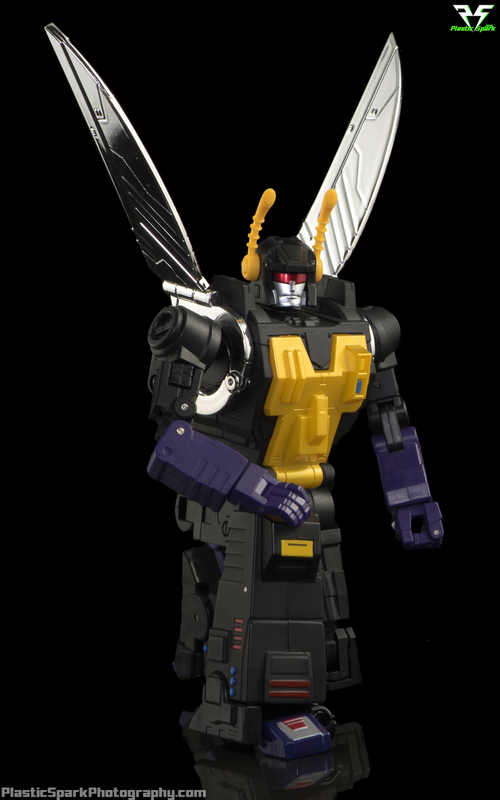 Forager transforms from a fairly chunky bug to an incredibly simple black and purple bot. While his presentation is fairly basic, he has an incredibly effective silhouette that works well for the character. Due to his transformation he has next to no alt mode kibble and his arms and legs are solid and clean. 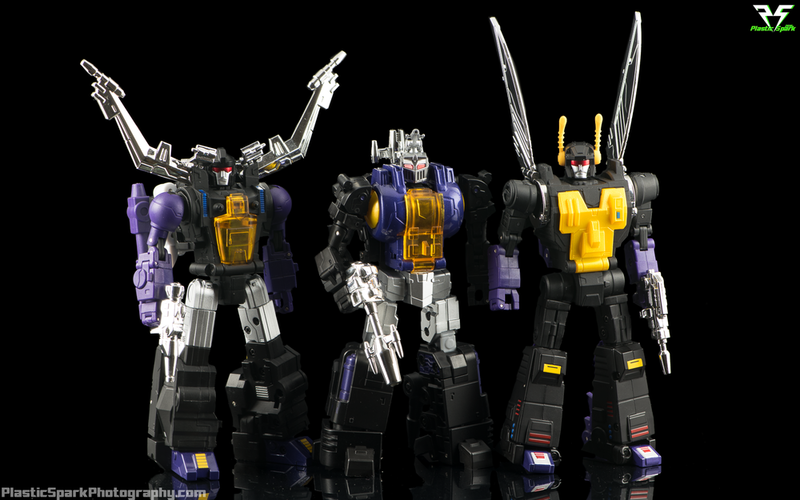 In fact I would say that Forager has the cleanest robot mode of all three Fanstoys Insecticons. The transformation of his upper arms and front bug legs is genius, if a little scary to pull off and it leaves him free of the distracting bug leg backpack that the other 2 are hauling around. I was a bit nervous as it basically involves pulling the entire shoulder assembly out on a fairly thin rail, and then swiveling at the base of the shoulder to push the front bug legs into Forager’s chest, and pull his robot mode arms out to their natural location. This also involves un-clipping the silver ring at the base of the wings and maneuvering it ever so precisely to allow the arm swap to take place. Study the instructions closely or check out a video of the transformation. This section could be quite fragile if you don’t know what you are doing and the last thing I would want is for anyone to break their brand new Forager. Just like in bug mode you can angle the wings however you prefer in bot mode. Forager’s articulation is on par with the other 2 bots in this series. Double jointed elbows and knees, universal joints at the shoulders and hips, single hinged hands, a waist swivel, and the now familiar Fanstoys signature ankle tilt. Forager’s entire foot doesn’t tilt in this case, rather just the front toe of the foot but it’s enough to pull off some dynamic walking, running, and combat poses. You have to slide the bug leg back a bit to access the double knee but it ends up being a workable piece of articulation that I expected to be locked up due to the transformation. I was able to pull of almost any pose I could think of with Forager and I was incredibly impressed with his posing potential. Forager’s head is a dead on ringer for G1 Kickback, and it’s on the usual 2 axis combination of a neck hinge swivel and hinge. Personally I would have loved a ball joint, or at least some head tilt, to pull of more cheeky expressions but I think there’s enough to work with for most collectors. While the face sculpt is pretty spot on I was a bit annoyed that on this copy his helmet doesn’t like to sit flat and there is a bit of a gap between the top of his face and the bottom line of his helmet. *** This is caused by the face swap gimmick that allows you to fold away his robot mode face in favor of a silver visor that allows you to hide the face in bug mode. 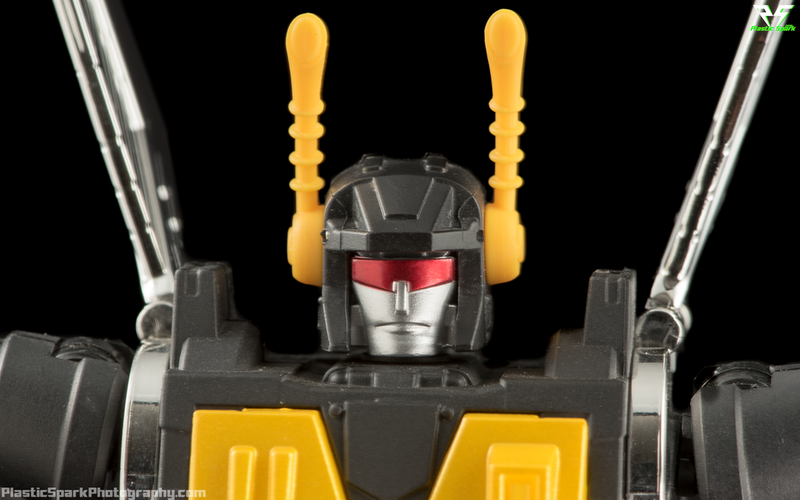 ***Upon further review I have found that I missed a step in transforming the face, there is an additional panel on the rear of the head that opens to allow you to further fold up the bug mode face and allow for a tighter fit of the helmet. Similar in design to Kickback's original G1 blaster. This accessory is well executed and the chrome application is fantastic. The blaster clips into Forager's hands with the usual MP tab on the handle. You can also store the blaster on the rear of the bug mode to make a sort of stinger. I don't personally like the look of it but it's a nice storage option for folks who need weapon storage. Another set of pink cubes, the same as the ones included with Spotter and Grenadier. As stated in my Grenadier review, "Small enough to look good with the bugs, not big enough to work with anyone else." Just like the other 2 bugs, Forager comes with a solid pearlescent yellow chest plate preinstalled, and a clear yellow plastic chest plate to homage the original G1 toy. This can be swapped out by unscrewing a tiny screw and replacing the chest plate. There is a screwdriver included with the figure. Forager ships with a replacement head cannon for FT12 Grenadier. The piece itself is a bit fragile so I imagine this is included to replace any broken head cannons on existing Grenadier figures. I did not notice any difference between the original cannon and this new one. I really enjoyed messing with FT-14 Forager, however I did find the overall package to feel a bit plain in comparison to the other 2 bugs. He fits the bill for pretty much anything I could possibly ask for in a Masterpiece Kickback. I think the inclusion of swappable faces or heads would have been a nice touch for both Forager and Mercenary, but they don't take away from the final product. I am concerned about how fragile the wings and shoulder rings feel. I can see these parts giving way for a lot of people if they aren't careful. Personally I think it would have been nice to see the shoulder ring made of Die-Cast if possible. At the very least I hope Fanstoys takes these concerns to heart and offers replacement parts to any users with broken shoulder or wing pieces. All in all I think Forager, and the Fanstoys Insecticons in general, are great representations of the original G1 Insecticons in a Masterpiece style package. 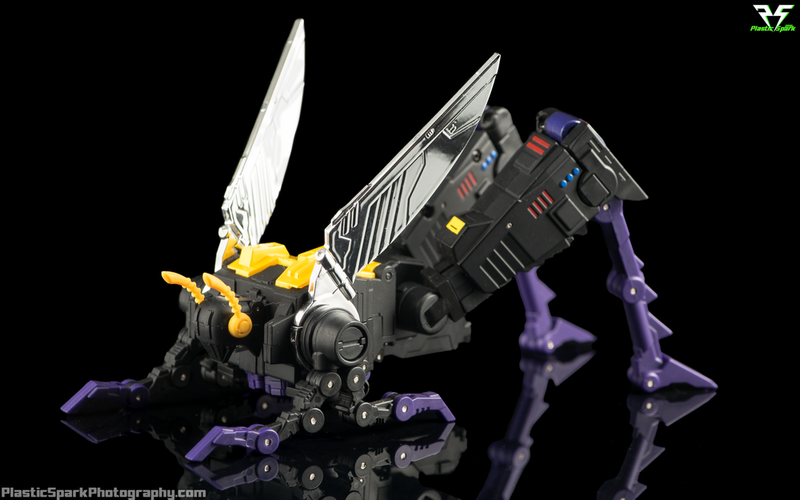 I would like to try and get my hands on the Badcube Bug Corps to compare the two currently available options, as it is I can't really give much of an opinion on Fanstoys VS Badcube but I do think that if you choose to go with Fanstoys for your Masterpiece Insecticons, you won't be disappointed. Ocular Max has also shown intent to take part in the MP style insecticon market soon as well. Short and simple, Forager is a fantastic, if simple figure and a great representation of Kickback for your Masterpiece shelf. As long as you are careful with your figures and don't ham-fist the wing portions you should be just fine. 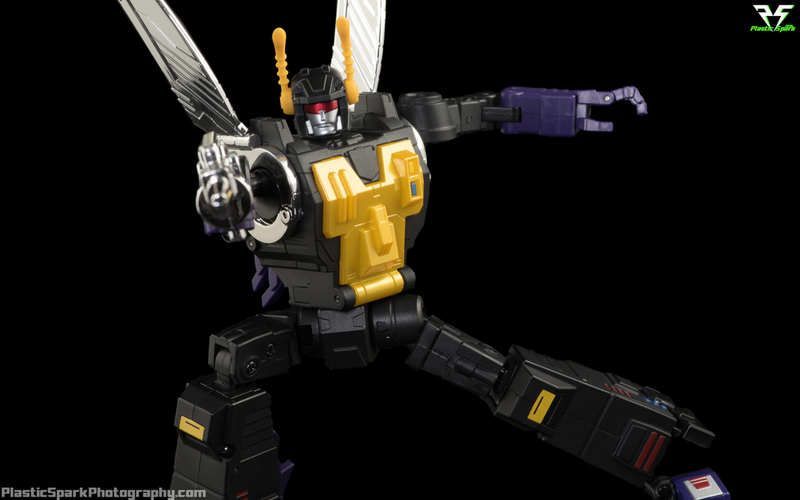 I have no troubles recommending this figure to anyone in the market for MP style Insecticons. What do you think? Leave me a comment below! I would love to hear your thoughts on Fanstoys FT-14 Forager! Check out the full high resolution gallery below! Check out Urban Pop Shoppe on Facebook!